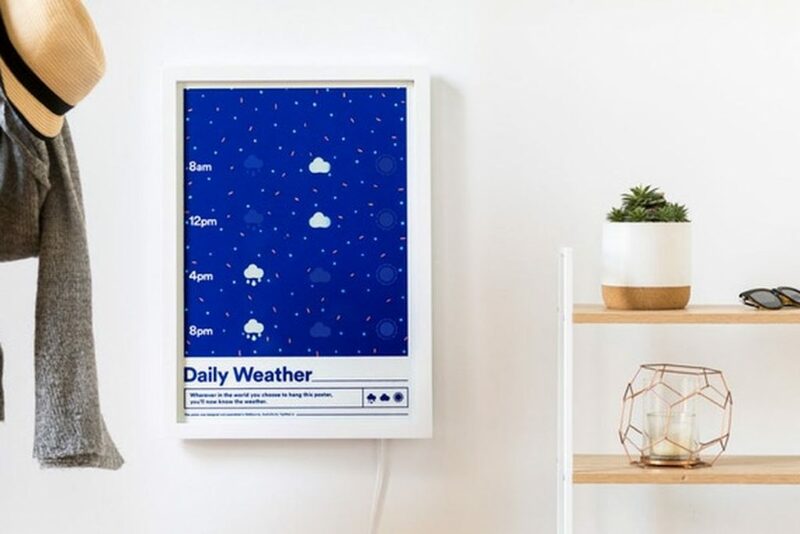 The Weather Poster, a Kickstarter project from designer Oli Woods and his company, Typified merges traditional art with modern technology. The Weather Poster shows you the upcoming weather forecast for the day. It’s not a particularly detailed forecast — just a single icon of whether to expect rain, clouds, or sun at 8AM, 12PM, 4PM, and 8PM. The screen is a traditional paper poster, which uses heat sensitive ink to “light up” the relevant icons using forecast data pulled from the internet. It is a mix of analog and digital technology. The Weather Poster supplies free forecast data for two years: after that, you have to pay $7.50 a year for the forecast information. This entry was posted in ART, TECH. Bookmark the permalink.